Brush the chicken with oil and grill on a griddle pan. Heat the beans, corn and tinned tomatoes in a saucepan. Bring to a simmer with the lid on. Stir in the coriander and a squeeze of lemon or lime juice. Season to taste. Heat the tortillas for a few seconds in the microwave. Spoon some filling onto the centre of the tortilla. Fold up the bottom then fold the sides over each other. Secure with a toothpick. 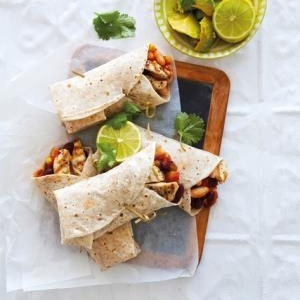 Serve warm with avocado or guacamole, extra coriander and lemon or lime to squeeze over.